The CarterMatt 2018 TV Madness Tournament is now officially over and what a tournament it was! This was a fun, exciting year of doing the polls and it’s always a thrill to see the fan bases rally and fight hard to make it far. This year in particular there was excitement on so many different levels. There were multiple early upsets, culminating in getting two Cinderella stories in the final four in The Brave and Absentia. There were also some great runs from shows such as MacGyver and Scorpion, which produced their best results in the 3 years that the tournament has been around. 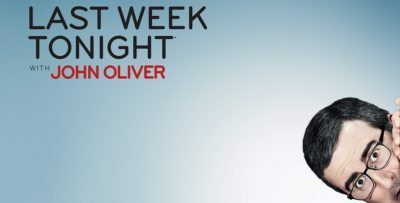 The play-in winner once again lasted at least a couple of rounds, which further validates its existence as a way in which to get more shows into the tournament that are readers picks. When the dust all settles, though, there can only be one winner — and what a winner it was this year in The Brave. 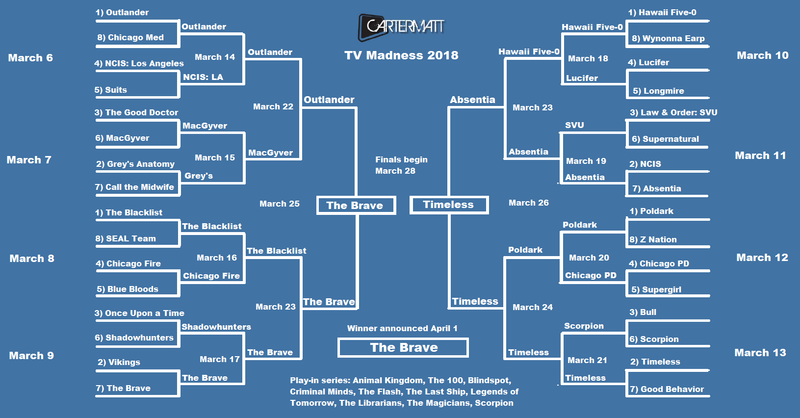 This is the first time that a #7 seed has gone on to win the tournament, and to go along with that it’s the first show in the three-year history of TV Madness that Outlander was defeated. This actually happened right before we got around to the final round as The Brave squared off against the series in the final four. The path for The Brave to make it to the end started with an upset over Vikings, which lasted at least reasonably far into the tournament last year. Then, the series took out Shadowhunters before dethroning its first #1 seed of the tournament in The Blacklist. After that it scored the big victory over Outlander, which set the record at that point for TV Madness voting. Then, it broke the record again in its victory over Timeless (fan bases for both of these show really came out in support!) in the final round with over 60,000 total votes tabulated. Before moving on, let’s congratulate all of the fans from all shows who spent so much time voting on what has been a really great edition of the tournament. Even if your show didn’t win it’s been great to see so many fan bases unify. It’s a real testament to the work that the creators, casts, and crews put in to make these shows as great as possible. What does this mean for The Brave? One of the great things about the series winning this year is it’s something that can be used to its benefit. This is a great way to show NBC that there are so many devoted The Brave fans willing to fight for the show. It gets the word out and, in turn, hopefully gets more people excited about checking out the show. The fans clearly deserve a second season based on all the work that they put into the tournament; the ball is now in NBC’s court to try and make it happen. What do you think about The Brave being declared the winner of TV Madness? Be sure to share in the attached comments! 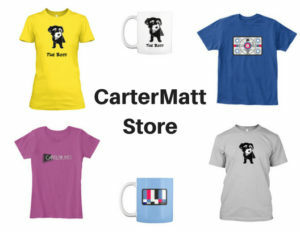 Meanwhile, be sure to also like CarterMatt on Facebook in the event you want some other news when it comes to the show.